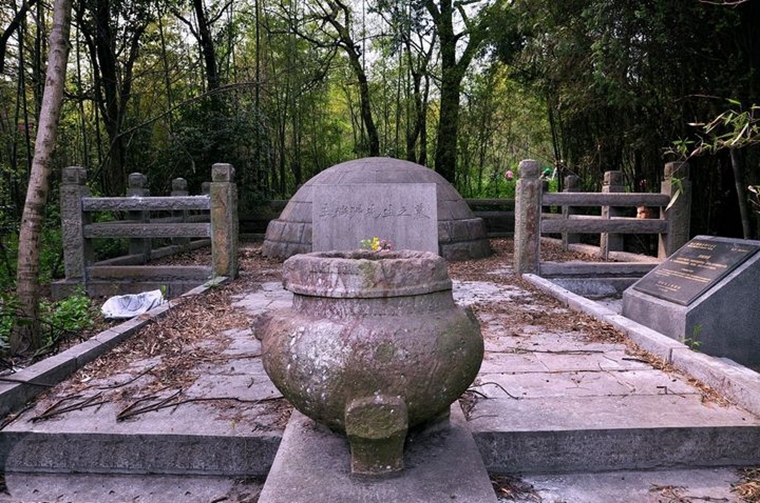 Here is Li Ruiqing’s Tomb, on the eastern side of Xuemei Ridge. Li Ruiqing (1867-1920), whose style name is Zhonglin, was a famous scholar, educator, calligrapher and connoisseur of Chinese calligraphy and paintings. 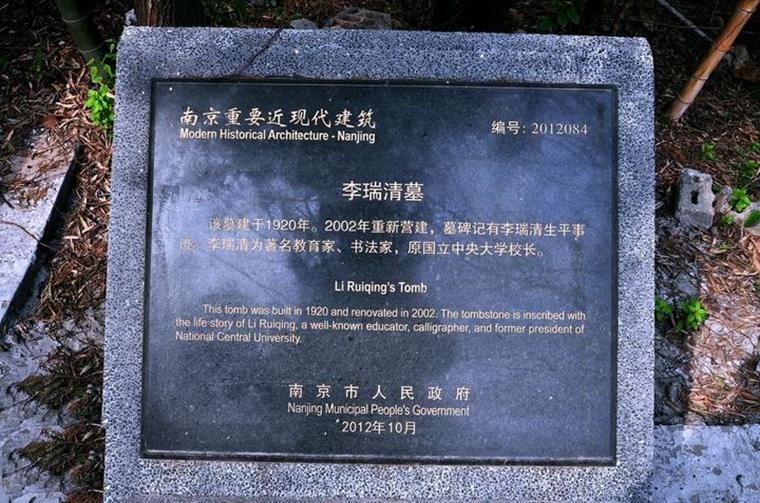 He was also an important founder and reformer of China’s modern education, a pioneer of China’s modern art education and China’s modern higher normal education. Li Ruiqing, whose ancestral home was in Linchuan, Jiangxi Province, was a metropolitan graduate during Guangxu Period, and was awarded Hanlin Bachelor by Hanlin Academy. Two years later after that, he acted as Supervisor (a President) of Liangjiang Normal School (origin of the former Central University and the present Nanjing University ), he also acted as Governor of Jiangnan. In the early years of the Republic of China, he lived on selling Chinese calligraphy and paintings. He had a unique perspective on calligraphy, and was good at all kinds of writing styles and painting mountains, water, persons and objects. He was especially good at appreciating paintings. He became famous soon at home and even abroad. In the early 1920s, the field of calligraphy in Japan invited him to write calligraphy for exhibition. Therefore, he was regarded as “No.1 of Chinese calligrapher through 500 years” in Japan. All his life, Li Ruiqing educated people and many of them became successful, such as the famous scholars Bing Zhong and Hu Xiaoshi, the painter Zhang Daqian, art educator Lv Fengzi and calligraphers Li Zhongqian, He Yanqing and Huang Hongtu in Fuzhou. Li Ruiqing died in early August, 1920, when he was 54. Kang Youwei had ever written elegiac couplet for him; Hu Xiaoshi and Zhang Daqian and his many other pupils prepared for his funeral, burying him here on the eastern side of Niushou Mountain. In April, 2002, Nanjing University celebrated its 100th anniversary. Then the university and the Bureau of Culture of Jiangning District jointly repaired the tomb, building corridors around the tomb and erecting a granite monument with inscriptions of his whole life. The leaders of Nanjing University, Jiangning District Government and Bureau of Culture of Jiangning District, as well as alumni and Li Ruiqing’s descendants held the unveiling ceremony here. The tomb, which was built with dimension stone and concrete, is 20 meters in circumference with the diameter of the bottom 2.1 meters and 1.3 meters high. In March 1992, the tomb was listed as municipal cultural relics protection unit.